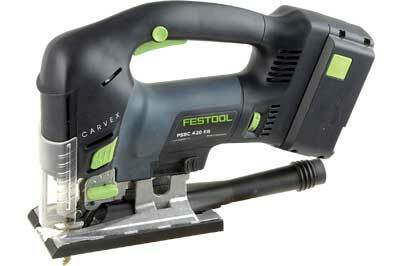 Festool have released an updated Carvex 420 in response to criticism from end-users about the earlier 400 model. Many Festool die-hards reported less-than-satisfactory results, with the main gripe being blade drift and the mechanism to correct it. There is a choice of body or stirrup grips, cordless or corded, and 240 or 210V. The pendulum lift has undergone a redesign and a second wheel has been introduced behind the blade to combat blade drift. The 420s have been installed with uprated brushless motors, from 500 to 550W, increasing the amount of energy transmitted to the cutting edge to around 80% of motor output. The 18V model batteries are designed to run 14m in 40mm kitchen worktop. The 420 now has an electronic monitoring system to optimise power output versus workload. It can be overridden by pre-selecting the speed or activated by selecting automatic mode. Fewer moving parts in a brushless motor mean they do run a lot quieter. There is a slight drop in weight, due to shedding more than 100m of copper motor wire, and LED lights that can be stay-on, switch-off or strobe using the two side switches. The existing accessories are compatible forwards and backwards across the range. All new machines will come with a new baseplate modified to accept the new blade guide mechanism. The rate of extraction is quite acceptable with a good vacuum. It's not 100% when cutting thick stock, but considerably better on thinner material. Fitting the chipbreaker results in clean cuts above and below the board. They are somewhat of a hindrance when swapping baseplates or fitting a new blade. Conventional wisdom suggests that a thin blade performs better on tight curves. 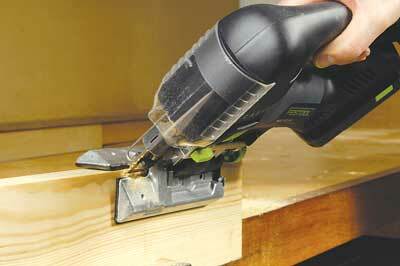 However, Festool technicians have proved otherwise by developing a thicker blade with a wide kerf. It creates more room for the blade to manoeuvre and reduces friction. A thicker blade remains rigid under load and absorbs more energy from the gearbox, transferring it to the cutting edge. Having a more efficient blade helps to resist heat build-up, prolonging the life of the cutting edge and its ability to cut straight under load. If you're experiencing blade drift of more than 2mm through 40mm stock with any machine, you're either attacking the cut too aggressively or using a dull blade. A vital step when fitting a new blade in the 420 is to set the guide jaws to the blade. This is done with the pendulum switch set to (3). Using the Allen key, adjust the jaws to just kiss the blade, not pinch it, then back off the setting by about half a turn. The standard baseplate will only allow you to make cuts at 90° to the surface. Given the sloppy way some machines tilt it left or right to make bevel cuts, it's a distinct advantage. A dedicated baseplate will dissect a 90° edge and leave you with a near perfect mitre. The pack contains a flexible trammel bar for producing circles and various non-scratch covers for the standard base.